If you choose not to integrate with an external user-management system, you can manage your Cloudify users on the manager itself, either by the CLI commands or the User Management widget in the Cloudify Console. You can create users, add them to user-groups, assign them with tenants under specific roles, deactivate and delete them. When integrating with an LDAP system, Cloudify will not allow you to manage users from the Manager, to prevent conflicts between the two systems which might cause security problems. Instead, users will log into Cloudify with their LDAP credentials, and the Manager will authenticate them against the LDAP service. To finish the authorization process into Cloudify, the users will have to belong to an LDAP group connected to one or more Cloudify Tenants. To create this connection between the LDAP system and Cloudify you must create user-groups in Cloudify that represent your LDAP user groups. You then assign those Cloudify groups to tenants in Cloudify Manager, with the desired roles. 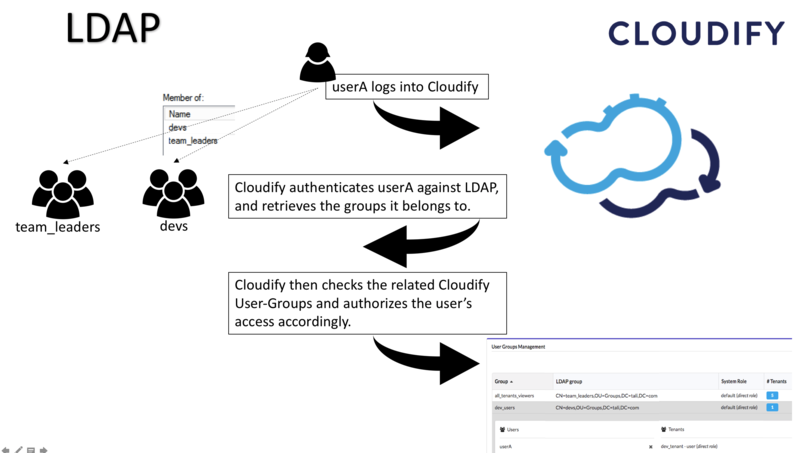 When a user logs into Cloudify, a request is sent to the LDAP system for authentication and identification of the groups to which the user belongs. Cloudify then identifies the tenants that the Cloudify groups (that represent the LDAP groups) can access, and allows user access according to the permissions the roles of the groups provide. For more information on creating a user group, see either the CLI command, or the Cloudify Console. When a user-group is added to a tenant, a specific tenant role must be assigned to it. By adding a user to a specific user-group, that user will inherit that user-group tenant-association along with its tenant-role. You can add and remove users and user groups to/from a specific tenant. To run these user-related tenant-specific commands, use cfy tenant. For more information, see the tenants command in the CLI documentation. list displays a list of all tenants in this instance of Cloudify Manager. By default, when you generate the list of tenants, only the number of linked user-groups and users is displayed. You can retrieve full details with the use of a --get data flag. When a user is added to a tenant, a Role must be assigned to it by passing a valid value in the -r/--role option. cfy tenant add-user -r <role name> ... adding a user to a tenant, and give him a role. cfy tenant add-user-group -r <role name> ... adding a user-group to a tenant, and give it a role. Cloudify lets admins enforce an account lock after a user fails for a specified number of login attempts. After an account is locked the user must wait the specified time period before another login attempt, or the admin can unlock the user account. Before you start to use the Cloudify Manager - Before you install the Cloudify Manager or after you install the Cloudify Manager, you can set the account lock settings in the config.yaml file. After you install or configure the Cloudify Manager, the account lock is enforced. failed_logins_before_account_lock - Number of failed logins (bad password) before account lock. account_lock_period - Account lockout time in minutes. -1 disables account lockout even when failed_logins_before_account_lock has a value.